The last five or six years have seen the corporate world plunged into turmoil, with banking and finance often at the centre of the storm. For some, the effect has been to end up on the wrong side of the office door, redundant and looking for a new job, or completely out of the industry they’ve known for so long. For others, particularly older workers, the short-term victory of hanging on to their jobs can seem anything but sweet as they struggle to adjust to a workplace that’s changing faster than ever. For them, the certainties of the past are being largely wiped out by a generation of younger workers – the Millennials are taking over. In the age of technology, these ‘digital natives’ are rising rapidly through the ranks, leapfrogging over their seniors into managerial positions and introducing new and different ways of thinking and doing. This can be a particularly unnerving experience for the 40+ employee, who is left feeling disorientated and resentful. So, if you’re in that boat, what’s to be done? Crucially, don’t focus on age. The truth is, if this is the way of the world, then no King Canute-like thinking on your part will turn the tide. Accept the inevitable, and don’t get side-tracked trying to compete. In fact, there are very real reasons to remain positive if you’re an older worker, particularly outside the corporate organisation. There are now 200,000 more women aged 50-64 in work than there were before the recession, says The Chartered Institute of Personnel and Development (CIPD). And that’s due in large part to the substantial rise in numbers among those setting up in business or becoming self-employed. Those findings are echoed by online freelance marketplace, PeoplePerHour, which has identified a two-fold increase in people in their late 50s and 60s going into self-employment. Given this fundamental shift in the way we’re working, there’s actually another gap, one that cuts across all ages, that’s increasingly relevant and could have a much greater impact on your future. Let me introduce you to two opposing tribes: the SUPER–Generation® (negative) and the SUPER+ Generation® (positive). The acronym SUPER, though common to both, means very different things for each (and is something I describe more fully in my book, ‘Corporate Escape: The Rise of the New Entrepreneur’). Those in the first group, the SUPER– are Superficial (they are focused only on appearance and possessions); Unfulfilled (simply having things isn’t enough in itself, so no matter how much they have, they always feel ‘empty’); Pessimistic (with events often seemingly beyond their control, they can’t feel positive about their future); Egocentric (with a self-centred viewpoint, they believe everything revolves around them); and Restless (not surprisingly, they are always searching for the next ‘quick fix’ to satisfy them). Do you recognise these characteristics in colleagues, family, friends or even yourself? Or are you more of a SUPER+ Generation® (positive) individual? If so then, you’ll be Successful, not waiting for things to happen, but making them happen; you’ll be an Unconventional thinker, so when there’s a problem you’ll find a creative way to solve it; you’ll be Passionate about what you do, making you an inspiration to others, particularly when it comes to pushing your projects forward; you’ll also be looking to make a difference, something that marks you out as innately Entrepreneurial. Finally, you’ll be Relational, meaning you instinctively know that the world is a place where ‘us’ matters more than ‘you’ or ‘me’. It’s this difference in mindset, stemming from your attitude, values, beliefs and life experience that should be more of a consideration for you than age. If you decide that you are going to remain within the corporate world, then by taking the SUPER+ approach, you’ll be flexible to the situation, adapting to the conditions, rather than complaining about them. But how much better, if you are a SUPER+, to recognise that perhaps the constraints of a corporate job no longer suit you. After all, is this a world in which you can be passionate, express your unconventional and individual way of doing things, relate to people in the way that you want and apply your ‘entrepreneurial thinking’ to generate success? Probably not. In which case the time may be right to get out, just like many other professionals and executives over 40 are doing, leaving behind the rat race to set up on their own as freelancers, independent contractors, business owners or entrepreneurs. Sadly, one of the major reasons why many stick with the corporate environment, even when they feel swamped and usurped by emerging Millennials, is that they simply don’t know what else to do. They are so defined by their past career, by what they’ve always done, that they can’t see the future holding anything else. But that rigid thinking is a self-imposed straight jacket. In fact, breaking free from one life to start another can be one of the most rewarding, exciting and liberating experiences for someone with unrequited talents and a dash of determination. 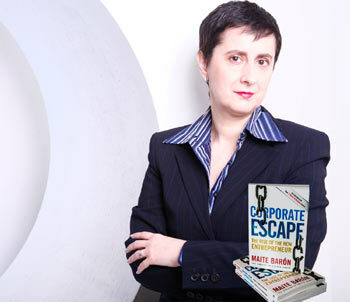 You may already know someone who’s escaped the corporate world to do something else, whether through choice, or because they were pushed, and now say that it was ‘the best thing they could have done’. Of course, that transition can be even more successful when it’s planned and undertaken under your control, rather than as a result of being catapulted into action by redundancy. So, if at work you’re increasingly a square peg in a round hole, rather than try to make yourself fit, don’t bother playing the game at all, and get out instead. In other words, stop worrying about the generation gap, it’s the mindset gap that’s more important. And if you’re not yet a fully paid up member of the SUPER+ Generation® club, you can be, using tried and tested techniques that will help shift your mindset.